For the 10th year, WildFlowers Australia Ltd has run a competition for floristry students. With the aim of promoting the use of Australian grown flora – both wildflowers and foliage – the competition has shown the diversity and strengths of our local flora while also flaunting the artistic designs and imagination of floral students across the continent. We also wanted to encourage incorporating Australian grown wildflowers with traditional flowers, commonly used in weddings, so that students can see how a combination of the two is often more exciting than either alone. This year, the competition theme was “Wedding Vows”. 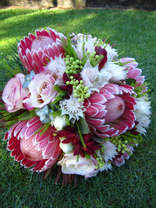 We specifically wanted students to explore the use of Australian grown wildflowers in bridal wedding bouquets, Students had to design and produce a hand-held wedding bouquet.